As one of Healthy Dining’s culinary dietitians, Olivia’s responsibilities include nutrient analysis for Healthy Dining’s restaurant clients. As program manager, she is also tasked with leading a groundbreaking effort to identify diabetes-friendly menu items from popular local San Diego restaurants on an app. This initiative is part of a pilot research project that could ultimately benefit tens of millions of restaurant-loving Americans with diabetes. Olivia’s interest in health and nutrition was an outgrowth of personal experience. Olivia has a bachelor’s degree in human nutrition and a master’s degree in community and behavioral nutrition from Virginia Tech. 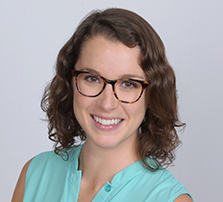 Having completed the certification for becoming an RD, Olivia continues to be passionate about empowering others to live healthier, active lives through health education and providing access to this information using technology.